Personally I wouldn’t be tempted to look through 86 chicken recipes, or 135 desserts, but somebody must! The website seems popular, and there is a tab for Delish Kids as well, which is smart. Although, “21 Ways to Get Kids Involved in Making Breakfast?” Just put them in the kitchen! 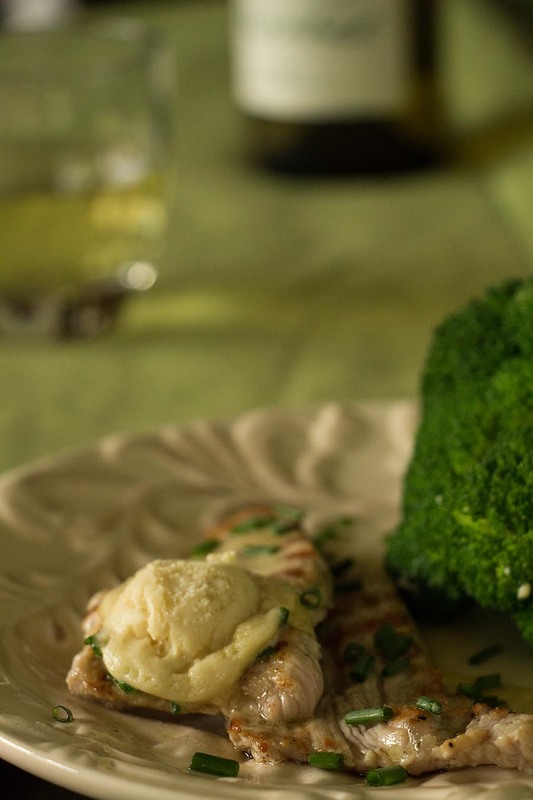 Nevertheless, I came across, in some random way, a recipe for Cowboy Butter from the Delish.com website. According to the website, the idea of “Cowboy Butter” came from a little restaurant in New York City called Mr. Donahue’s. My world changed after I dunked a piece of prime rib into the herb-speckled butter, and the wheels really started turning once I realized everything on my plate — crispy potatoes, Parker house roll, and even mac and cheese — tasted good with it. Well it certainly appealed to me as well, and I knew the next time I grilled steaks, I’d have to make this magic butter. In a small bowl, combine the butter, lemon juice, garlic, shallot, mustard, horseradish, cayenne and paprika. Whisk to combine. Stir in the parsley, chives and thyme. Whoever came up with this stuff was right. I started not only dipping the steak into the butter, but also the green beans. Good stuff. That’s all I can say. I can see it drizzled over grilled meats of any kind, plus seafood like shrimp, crab, and scallops. Or, over grilled vegetables or baked potatoes. The possibilities are endless. Make some – you’ll love it! Recently I re-read the cookbook, “How to Roast a Lamb, by Michael Psilakis. I read it originally when I first bought it, in 2009 according to Amazon. My modus operandi is to read a new cookbook, then put on the shelf. When I have more time, I re-read it, with my little sticky notes on hand to mark recipes, even if 8 years have passed. I might own too many cookbooks when I can “lose” a cookbook that easily. What I hadn’t remembered about “How to Roast a Lamb,” is that it is one of the best written cookbooks ever, in my humble opinion. Not the recipes; they’re kind of a mess. Michael Psilakis is Greek-American, who although born in the United States, didn’t speak English until entering first grade. Just like the family in “My Big Fat Greek Wedding,” his was large and sometimes loud, but there was love, and there was food. In the introduction, Michael tells the fascinating story of how his rise to chef and restaurant owner began, with fateful events allowing major opportunities in his life. In spite of some rebellious years during his teens, Michael always made it home for dinner. Michael Psilakis’s stories that precede each chapter beautifully describe the love and respect he had for his family growing up, and his mother’s passion for food and cooking that he inherited. Brush the onion slices with a little oil and season with salt and pepper. On a hot grill pan, grill until tender. Separate the onion into rings and chop fine. In a bowl, combine the chopped grilled onion, lamb, pork, mustard, coriander, parsley, dill, scallion, and garlic purée. Place a 4-5″ ring mold on a clean work surface. Lay a piece of caul fat over the top with a few inches overhanging all around. Place half the lamb mixture in the center and press down to form a thick, flattened disk. I simply did the same thing without using a ring mold. Preheat a cast-iron skillet until hot. Brush the burgers lightly with olive oil and season with salt and pepper. Place the side with the caul fat down first, grill, and turn over untl firm and char-marked on both sides, to your desired doneness. My burgers were cooked to medium-rare, although you can’t tell from this photo, but of course they can be cooked longer. And being an American, I had ketchup on hand. Don’t roll your eyes, I actually ate the burger with only a little Dijon mustard. It was way too good to smother with ketchup of course! These lamb burgers were really incredible. I can’t imagine them tasting any more delicious. The roasted garlic addition was probably not too far off of the chef’s garlic purée, which is a purée of garlic confit. There was one mistake, where cumin and fennel are supposed to be included in the lamb mixture, I’m assuming, because they were listed in the ingredient list, but omitted in the directions. If you’re wondering how I got my hands on pork fat caul, it is because of a website I’d recently discovered, called Heritage Foods USA. It’s also where I got my ground lamb; my local store’s situation with lamb is hit-and-miss, but mostly miss. It is a unique experience working with the lacy caul. It looks so delicate but don’t let its dainty looks fool you! To this day, my favorite thing to do in the kitchen when deciding what to cook for dinner, on the rare occasion that I have nothing planned, is to go to my refrigerator and create a meal. Now, it actually helps to have food in the refrigerator when doing this. Even an Iron Chef can’t create a meal with no ingredients. Today I wanted something hearty and comforting. I happened to have chicken breasts and bacon, so those two items were the inspiration for this dish. I’ve watched my fair share of cooking shows and competitions, and if a competitor ever chooses chicken with which to participate in a challenge, it’s like an automatic loss. Chicken just doesn’t have the magic that other meats do. 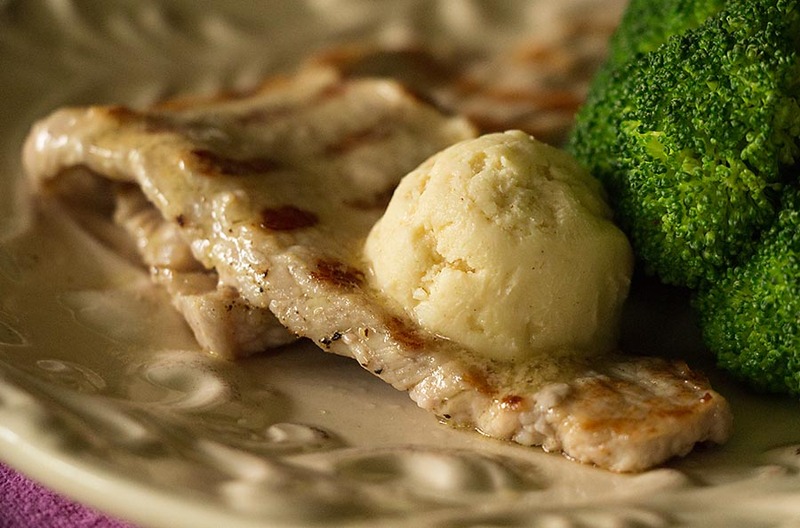 Chicken breasts can be moist and lovely, but they must be cooked properly. Actually I can, and I have said that about all meats. 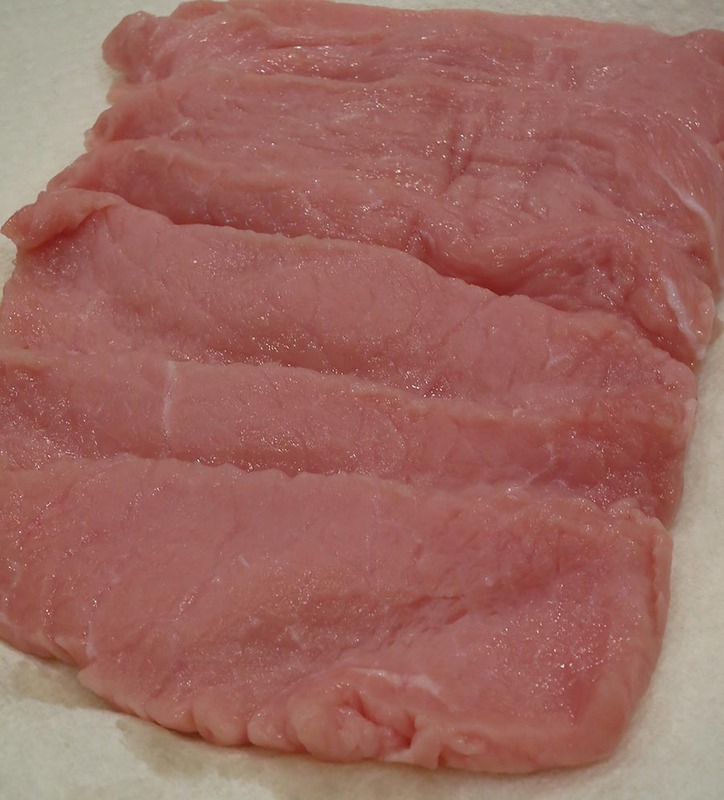 But some meat can be slightly forgiving; chicken breasts are not. Chicken is widely available in the U.S., and it’s fairly inexpensive, so it’s quite commonly used. Even better, if you’re watching your pennies, whole chickens are extremely inexpensive and can be easily broken down into breasts, thighs, and so forth. I’ll show you what I do sometimes with chicken breasts to ensure a perfect cook, and present them in a way that’s perfect for a comforting winter meal. This dish isn’t fancy in any way, but if you’ve been dining on frozen pizza lately, you’ll think you’re dining at a Michelin-starred restaurant. I guarantee it! To begin, dry off the bacon with paper towels, if necessary. Then dice it. Place the bacon in a hot skillet. Add a splash of olive oil if necessary. It depends how fatty your bacon is. 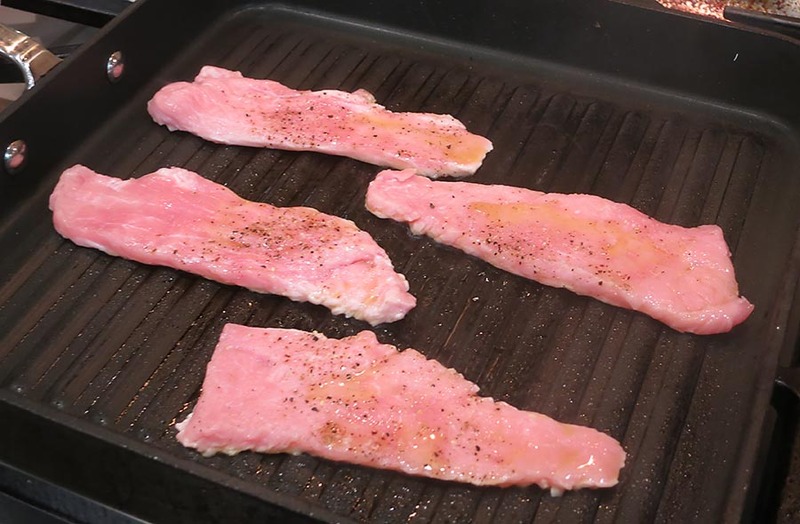 Cook the bacon until browned, then using a slotted spoon, place the bacon on paper towels to drain. If there’s too much bacon grease in the skillet, remove some and save it for other purposes. 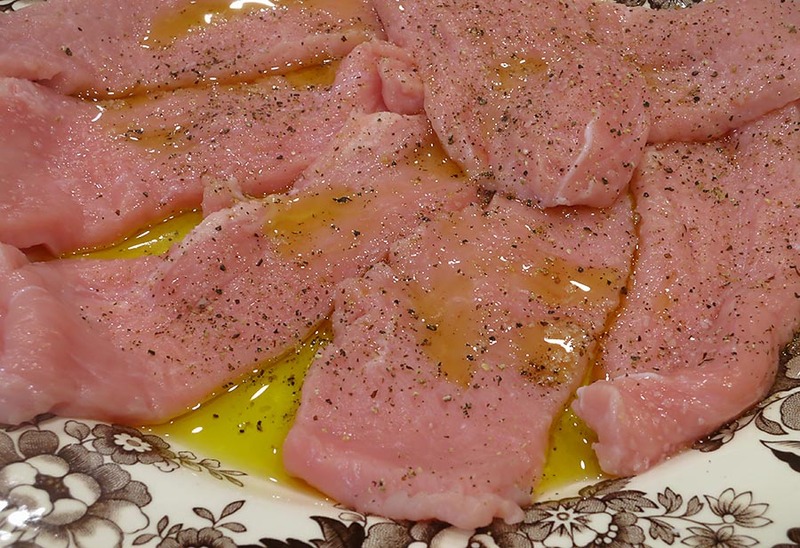 To prepare the chicken breasts, take a sharp knife and cut along each breast horizontally, to make two breast pieces that are more uniformly thick; one will be smaller and slightly thinner than the other. Pound any part of the chicken breast slices that are slightly thicker. Season with salt and pepper. Place two of the chicken breasts in the skillet with the hot bacon grease. 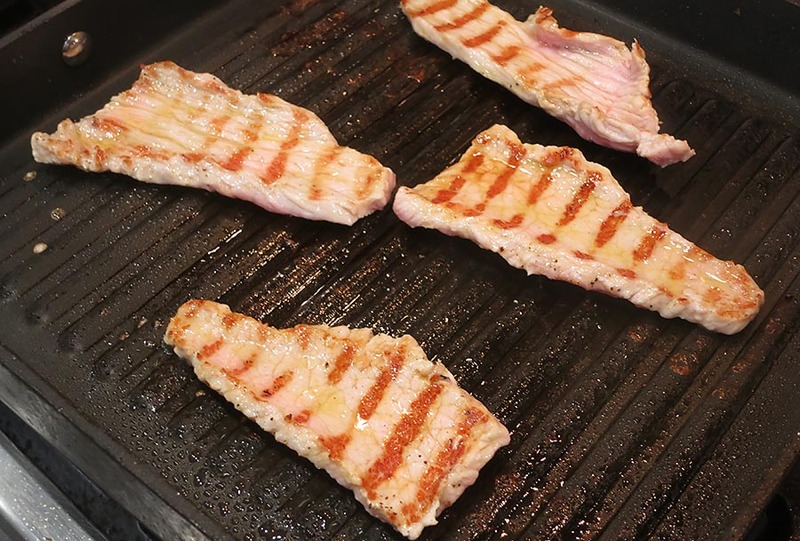 If you’re concerned about uneven cooking, cook the two same-sized breast pieces together. You can always use a thermometer to make sure that the internal temperature doesn’t go over 150 degrees. Brown on both sides, and lower the heat slightly to cook the breasts completely, although properly. Place them on a plate and cover them loosely with foil. Add the shallots and sauté them until soft and golden. Meanwhile, add the demi glace to a small measuring cup or bowl and all a little water to cover. Microwave until the water is hot and whisk in the demi-glace until fully incorporated. Have this, the reduced cider (see below), the mustard, and the cream on hand. When the shallots are golden, pour in the demi-glace mixture, add the mustard, and then pour in the cider reduction. Stir well and cook for a minute. Then add cream. The amount of cream you use depends on how creamy you want your sauce. I kept mine slightly thick, but you could easily add twice as much as make a cream sauce. Sprinkle in a little dried thyme, if using, and taste sauce for seasoning. Then add the bacon and stir in well. This just softens the bacon. If you prefer, save it to sprinkle on the top of each serving. For each serving, I placed the larger and smaller chicken breasts on two plates. I divided the bacon cream sauce between the two plates, and used steamed green beans as the side. Just for fun, I sautéed a few apple slices, just to enhance the apple flavor in the sauce resulting from the reduced cider. Of course, this step is not necessary, it was just a fun addition. If you do this, just a few apple slices is all you need. So as you can see, a very delicious and hearty meal was created with the simplest of ingredients, namely chicken, bacon, shallots, apple cider, demi-glace, and cream. Onions could be substituted for the shallots, and broth could be substituted for the demi-glace. In the case of the apple cider, which in my case my hard cider, I have never come across a family that didn’t have some kind of apple juice in their refrigerator! * A reduction, no matter what kind of liquid it is, is just that – a reduction of volume. Through a light simmer, you gently evaporate the liquid, which thickens it, and also creates a more concentrated flavor. Then it can be incorporated in a sauce, a vinaigrette, or a soup. It’s a simple technique, and one you should know. I used a cider from Normandie which was a present from my mother; we happened to have about 2 cups leftover that would have gone flat. The Normandie region in France is famous for their apple-based booze, like Calvados. From the 2 cups of cider, I ended up with about 1/4 cup of reduced cider, perfect to add to the above cream sauce. This recipe comes from a cookbook I was gifted by my family, Kitchen Garden, published for Williams-Sonoma. It’s exactly what you’d expect with that title – seasonal recipes using fresh garden fruits and vegetables, plus a chapter on chicken coops and bee hives. The author is Jeanne Kelley. 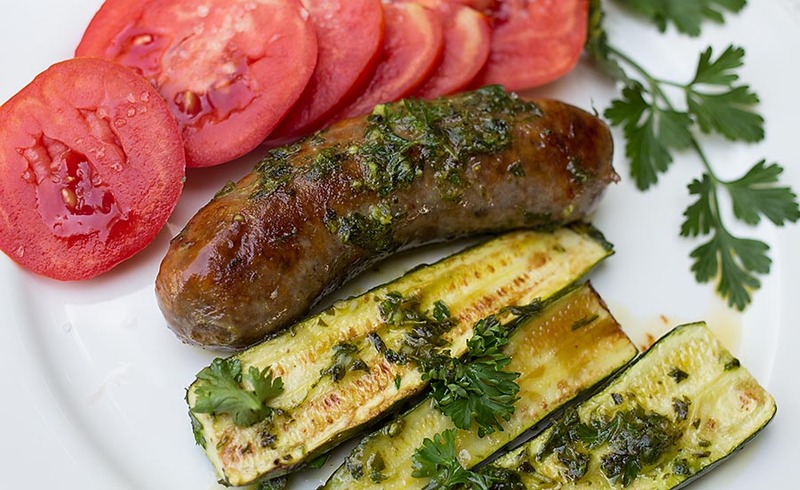 Now, every one has enjoyed grilled sausages and zucchini, I’m sure, but this recipe caught my eye for a specific reason. 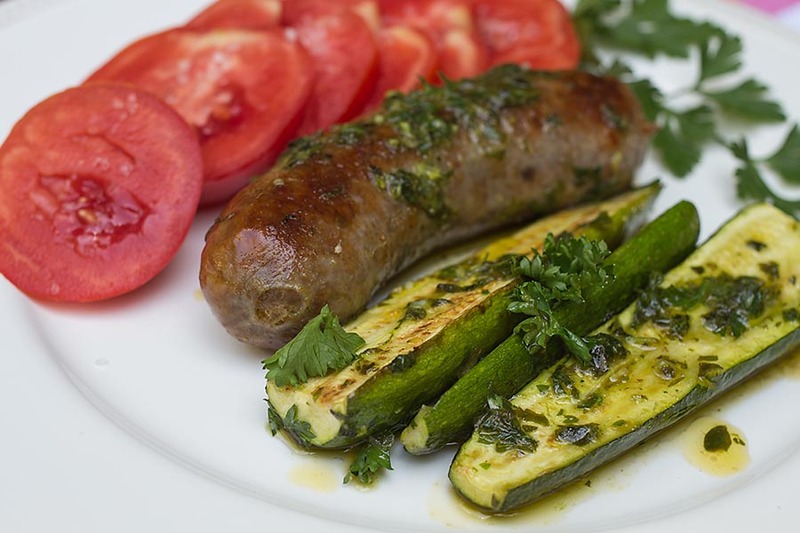 After the sausages and zucchini are grilled, they are tossed with a green sauce. The sauce it not unlike a chimichurri, if you use that term loosely, but with the addition of fresh basil, oregano, and capers. My husband hates capers and everything pickled. So for today’s recipe I’m omitting them. But I’ll probably toss a few on my sausages and zucchini when I sit down for dinner tonight. First make the green sauce by adding all of the ingredients to a food processor, except the oil. Process some, and then add the olive oil. I left it with some texture to it, but you can alternatively make a smooth puree. Although, if you want it really smooth, I’d use a blender. Prepare a charcoal grill, electric grill, or whatever you’re going to use to cook the sausages and zucchini. I’m using my oven for the “grilling” because I have a wonderful roast setting on it that roasts both meat and veggies perfectly. Preheat your oven to 400 degrees, if you don’t have a roast setting and want to use your oven. 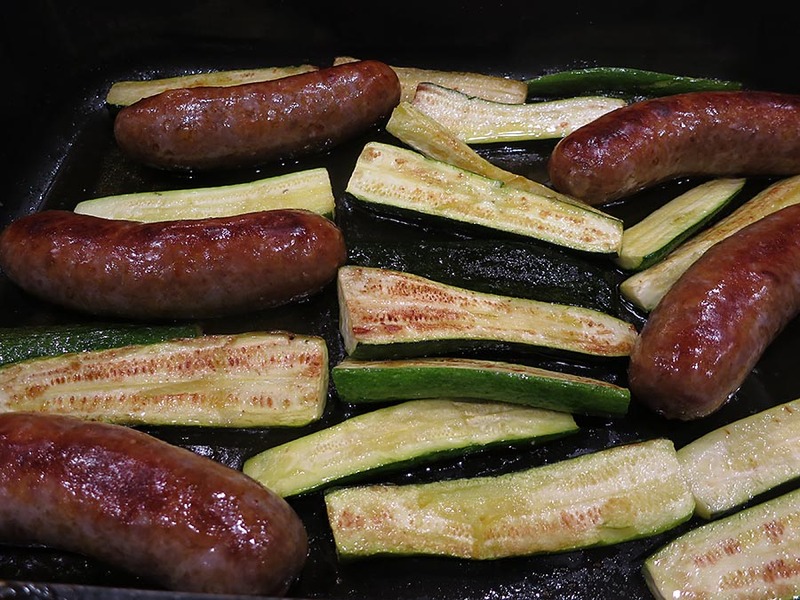 Place the sausages and zucchini in a roasting pan and drizzle some olive oil over everything. 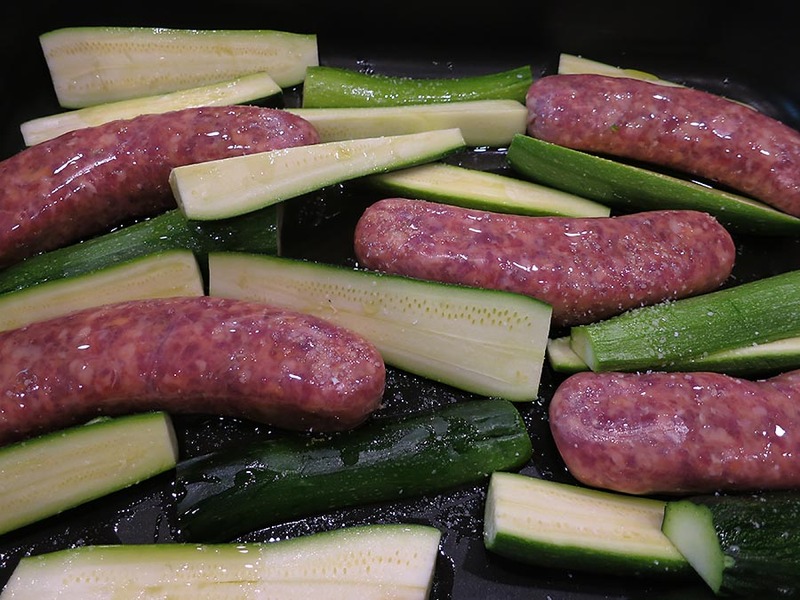 Place the pan in the oven and roast until the sausages are no longer pink, and the zucchini are fully cooked as well. Pour some of the sauce over the sausages and zucchini, and serve with extra sauce. And add capers, if you’ve been forced to omit them from the sauce. I completely forgot about the capers, and it was delicious without them. I served the sausages and zucchini with slices of a ripe garden tomato sprinkled with salt. A lovely meal!